This fall semester, two Syracuse University College of Law students will play their part in a judicial appointment that has the potential for momentous political, social, and historical significance. 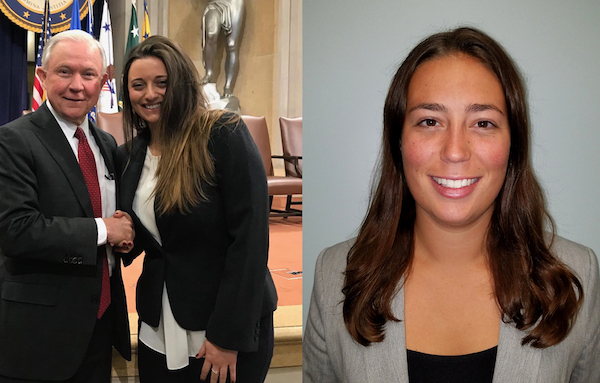 3L Kristina Cervi and 2L Emily Green will be working for the US Department of Justice (DOJ) Office of Legal Policy (OLP), helping with the confirmation process for US Supreme Court nominee the Hon. Brett Kavanaugh. "This is an exceptional opportunity for both students," says Faculty Director of Externships Professor Terry L. Turnipseed. "OLP is a highly prestigious division within DOJ. Most of the office's attorneys have had Supreme Court clerkships." Turnipseed says that Cervi's opportunity came via the College of Law's Washington, DC, Externship Program (DCEx). Thanks to the support of Turnipseed, Cervi externed at OLP during the Spring 2018 semester, working on nominations of federal courts of appeal judges. "Both the judges and OLP were very impressed by Kristina's intelligence and dedication," notes Turnipseed. "In fact, it is possible she will be offered a clerkship from a judge she helped prepare for his confirmation hearing." "When Judge Kavanaugh was nominated," continues Turnipseed, "OLP reached out to Kristina to ask if she could rejoin them in August to work on the nomination. The attorney in charge of hiring externs specifically mentioned her performance and work ethic." Turnipseed says that it became clear that OLP was seeking additional interns to work on the project. "I recommended second-year student Emily Green, and after several interviews she was hired, pending her background check." Led by Assistant Attorney General Beth A. Williams, OLP describes itself as the DOJ's "think tank." Its activities include legal policy and regulatory development, special projects, and assisting the President and the Attorney General with the selection and confirmation of federal judges.